1 SLR(R) 765 – Tay Joo Sing v Ku Yu Sang  3 SLR 719 – AC CHEONG & CO.
Court: Court of Appeal Coram: Yong Pung How CJ, M Karthigesu JA and L P Thean JA Counsel: Cheong Yuen Hee and Cheong Aik Chye (Judy Loke & Cheong) for the appellant; Margaret Wan and Sum Chong Mun (Braddell Brothers) for the respondent. Remarks : This is an appeal, inter alia, on the measure of damages for breach of contract of sale of a property. 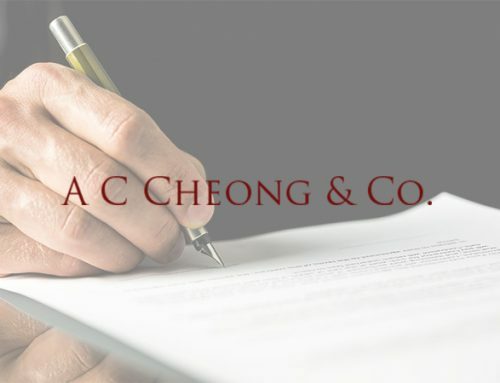 AC Cheong & Co. is a Singapore law firm with a long-standing history of more than 40 years.